Conflict has often been a driver for technological advances and computer science has been no exception. 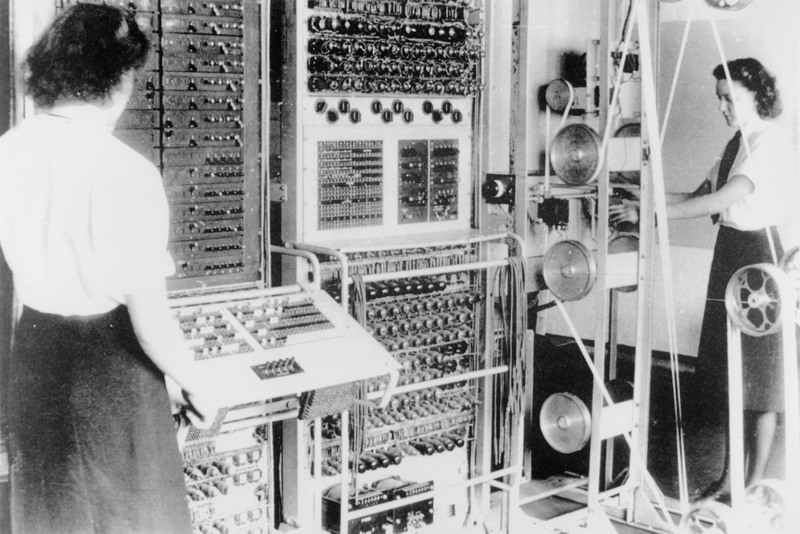 The requirements of code breaking during World War II led to the construction of Colossus – the first totally electronic computer device, while the Internet was originally constructed to provide a secure communications network for the military in the event of a nuclear war. While terrorist use of technology, and particularly the Internet, receives tremendous press, the current conflict is also sparking important developments in computer science that will have impacts far beyond the security realm. My employer, the Laboratory for Computational Cultural Dynamics (LCCD) at the University of Maryland is one group seeking to develop the theory and algorithms required for tools to support decision-making in cultural contexts. LCCD has developed numerous systems including T-Rex, which can rapidly scan text in several languages and convert it into a database and SOMA (Stochastic Opponent Modeling Agents) which can extract rules of likely behaviors by organizations from their past behaviors. The human brain is an impressive system, which also builds models. In some regards it far exceeds anything on the horizon in the realm of computer science. The ability of human beings to take information and place it in context and draw conclusions from it is profound. We build complex models of how the world works in order to function in it. But computers can process some forms of data far faster than humans and will do so systematically. Human minds cannot quickly process large quantities of data. In attempting to make sense of large amounts of information a human beings may discount or ignore information that does not fit in their model of how the world works – or alternately draw significant conclusions based on a very limited amount of data. Imagine an economist ignoring issues of ethnic identity in analyzing a nation’s policies or a political philosopher focusing on ideology while ignoring logistics in studying a terrorist group’s behavior. In short, computer systems are capable of substantially augmenting the power of human reason. The impacts of these technologies will be profound. Real-time data collection and processing will potentially improve decision-making in many ways. Beyond providing better intelligence, it will allow the creation of in-depth virtual environments, which facilitate training to operate in different cultures. The Marines and Army have built mock Afghan and Iraqi villages staffed by actors for this kind of training. These are terrific facilities, but a computer simulation could inexpensively augment the real world training. According to the late Alexander George, a renowned scholar of the presidency, many foreign policy accidents have occurred because leaders were unable to see the situation from the perspective of their counterpart. Leaders make assumptions about their opposite number and his (or her) actions based on an intuited model of their behavior. Models not operating on limiting assumptions may provide alternate explanations for behaviors and thereby give leaders the insight to avoid escalating conflicts that arose from misunderstandings. But these systems will also have civilian applications. Game theory systems used to predict the behavior of adversaries may also be used to understand the behavior of business competitors. Tools that can analyze the opinions expressed on jihadi websites could also be used to analyze public opinion for marketing research. Models that identify the outbreak of terrorism and insurgency may also be turned to studying the outbreak of disease. But this focuses on applications designed for policy-makers – and no doubt there will be many such tools. But only twenty years ago, very few people imagined a ubiquitous, international system that facilitated instantaneous communications and put vast amounts of information virtually at every user’s fingertips. Models and game theory will not remain in the realm of executives and professional analysts. They will also become everyday tools used by regular people to better plan their activities and make decisions about their lives. In this vein, ICCCD2009 could prove to be a fascinating glimpse into the future. The Fort Hood attack was an intelligence failure, just like 9/11 and so many others before. In retrospect, it all seems obvious – these kinds of failures always do. It is easy to blame bureaucratic inertia, but it is also unfair. Large organizations need procedures to function. Priorities must be set and decisions have to be made and implemented. Examining the system failure is revealing, both about the challenges in preventing these kinds of tragedies but also in how they reveal some of our society’s core values. They told him that he would be allowed out only if Rumsfeld himself O.K.’d it. .This may be a slight exaggeration, but removing Hasan would certainly have required authorization from people several levels higher in the chain of command – and the bases for doing so were not evident. What was clear was that Hasan was odd and said disturbing things and that he did not appear devoted to the job and the Army. Virtually every bureaucracy ends up with at least a few such characters. Usually they are slowly eased out. To fire them, without clear evidence of criminal activity, is much harder. It would have taken enormous amounts of time and since Hassan was a Major, General officers would need to have been involved. There were obvious incentives for easing Hasan out, rather than attempting to dismiss him. No doubt, Hasan’s colleagues are no wishing that they had pursued this process nonetheless and in the future officers faced with comparable situations undoubtedly will do whatever is necessary to remove individuals. But the organizational procedures that make it difficult to remove officers exist to protect them from the arbitrary whims of their superiors. This reflects our cultural belief in meritocracy over patronage and it is a value that has served us well. Hasan had also garnered the attention of the FBI-led Joint Terrorism Task Force (JTTF.) Here too, necessary organizational procedures failed to make the crucial connection. The FBI has to prioritize threats – the agency lacks the resources to track down every rumor and case of idle chatter (and an agency capable and mandated to do so would end up resembling STASI or the KGB.) This article from NPR’s All Things Considered gives some insight into the FBI’s criteria – the essence is “The closer the link to al-Qaida, the more serious the plot.” There are three levels, the people directly linked to al-Qaida (travel to Pakistan for training followed up by regular communications is seen as a big red flag.) The second level threats are plots linked to al-Qaida affiliates. The third level threats are the “angry young men” that are often radicalized on the Internet. Hasan would have been a “level three” except that he was a bit older then the usual recruits and his exchanges with radical cleric Anwar al-Aulaqi did not appear to be terribly angry. The FBI determined that he was not a threat. The fact that the JTTF became aware of Hassan’s email exchange indicates what an enormous volume of material they are required to analyze. Priorities have to be set. Had the analysts gone one step further and spoken to Hasan’s colleagues there is a chance that the dots would have been connected. But the JTTF’s judgment was not an irrational one. Future instances of military personnel corresponding with radical Islamists will undoubtedly be bright red flags in the future. Organizations (like Generals) always prepare for the last crisis. Just as a 9/11-type plot will probably not be successful in the future, it is probable that the appropriate agencies will be able to head off tragedies like the Fort Hood murders in the future. The question of what is next remains.